Mane Depot Shrinkies are our premium adhesive-lined shrink tubes preferred by hair professionals and DIY around the world. Offering superior shrink ratio and hold, we supply an entire line of shrinkies in convenient lengths to suit all your needs. We are the only company to provide you with custom order lengths. What you don't see here, we can make, cut and package according to your exact specifications. We welcome all online stores and retailers for reseller opportunities. Mane Depot Shrinkies are clearly the best! Our premium adhesive-lined shrink tubes are preferred by hair professionals around the world. Superior shrink ratio and hold. 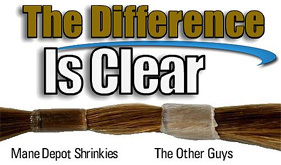 We carry an entire line of Premium Shrinkies in micro, standard and extended length which are available online. We offer the unique service of bulk shrinkies in custom order sizes. What you don't see here, we can make, cut and package according to your exact specifications. We welcome all online stores and businesses for reseller opportunities.